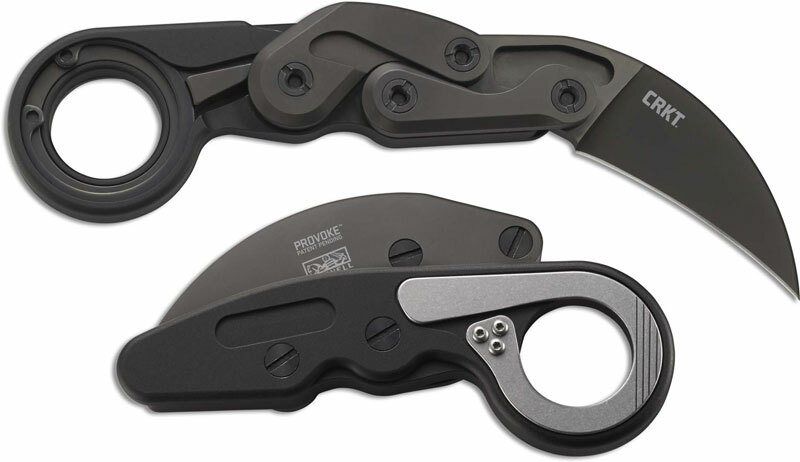 The CRKT 4040 Provoke Karambit Knife was designed by innovator Joe Caswell of Newbury Park, California as part of the Forged by War program. The Provoke is a compact tactical knife that is deployed via Kinematic Actuation™ - from the CRKT product guide on how Kinematic™ works: At first glance, it might look like a tool relegated to the professionals. But thread your finger through the ring, firmly grasp the handle, and your thumb intuitively rests on the deployment curve. Light pressure is all it takes for it to lunge to life and disengagement is just as simple. Shift the discrete lever at the base of the finger loop and nudge the blade back into its retreated position. The CRKT Provoke features a 2.410 inch beefy hawkbill blade made of D2 steel, .209 inches thick, with a non reflective black TiNi finish and Kinematic™ Actuation. The black 6061 T6 aluminum handle with silver accent, 4.968 inches closed, has a lever lock and a ring pommel. The Provoke has an overall open length of 7.250 inches, and it weighs 6.1 ounces. As part of the Forged By War program, a portion of the CRKT net profits from the Provoke will be donated to Joe Caswell's charity of choice.